Arrowhead Elementary School Garden Club members helped to beautify their school grounds by planting pansies and colorful pinwheels in planters. 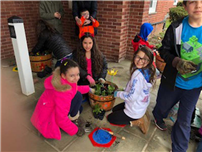 The planters were provided by the school’s Positive Behavior Intervention and Supports Committee last spring and the 52-member club helps to maintain them throughout the year. In the fall they planted mums in the planters, which are located at the school’s main and security entrances.